If like me you have thousands of photos saved in different places around your home on hard drives, clouds, mobile devices or computers you may be interested in a new device called Pholio which has been specifically designed to “set your photos and videos free”. 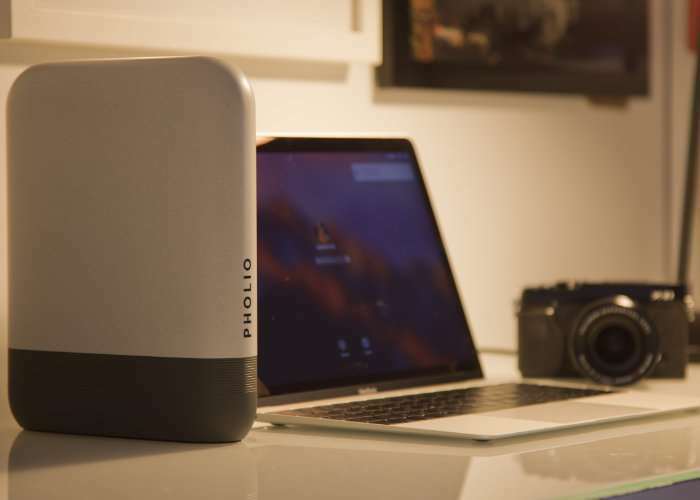 Watch the demonstration videos below to learn more about the Pholio and how it can help you create a photographic archive that doesn’t hide any of your memories away and automatically indexes them. ▪ With Pholio you can now navigate through your lifetime of photo and video collections directly from your desk or sofa, any time and in any way you choose. ▪ Pholio is open to all the family, whether browsing on PC/Mac, tablet or Smartphone. ▪ Pholio is ‘user-trained’: it personalises to the searcher, finding the images they care about most and allowing them to create their own specialist classifiers. ▪ Pholio has fast, accurate face detection and recognition so you can navigate to the people you want to see. You just tap on a face in an image and you’ll instantly find more content of that person. ▪ Pholio’s discovery mode gives you effortless browsing, guided by your content search. Sit back and navigate through years of images, swiping right for ‘more like that’ or left for ‘less like that’. ▪ Pholio can search within videos to find your favourite moment or go to the perfect still shot, all without you having to watch full playback. ▪ Pholio makes all your collections searchable from within your private box; with options for encrypted back-up services for added security (coming soon). Visit the official Pholio website via the link below for more details and to purchase.